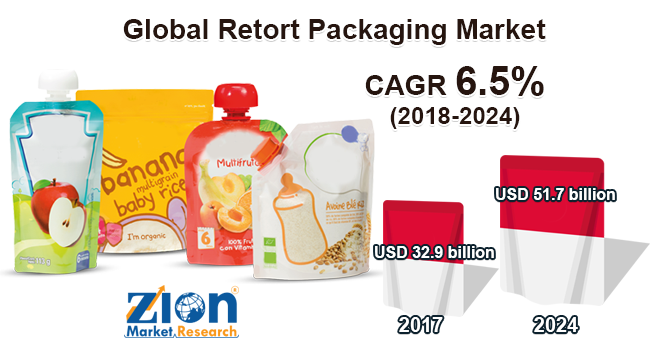 Zion Market Research has published a new report titled “Retort Packaging Market by Type (Cartons, Pouches, and Tray), by Material (Polyester, Aluminum Foil, Nylon, Paperboard, Polypropylene, Food-Grade Cast Polypropylene, and Others), and by End-User (Beverage, Healthcare, Food, Personal Care, and Others): Global Industry Perspective, Comprehensive Analysis and Forecast, 2017 - 2024”. According to the report, global retort packaging market was valued at approximately USD 32.9 billion in 2017 and is expected to generate revenue of around USD 51.7 billion by the end of 2024, growing at a CAGR of around 6.5% between 2018 and 2024. Retort technology has been developed and perfected for the high-speed commercial applications. Advancements in food and packaging technology have extended the shelf-life of food and beverage products. Retort packaging helps to prevent food from contamination and improve the aesthetic appeal of the product. Retort pouches consist of additional features such as pour spouts, spouts and fitments, zippers, release valves, and slider closures. Retort packaging is a food packaging type and it is made up of heat-resistant metal foil and laminated plastic. In retort packaging, food is packed into the metal can or pouch before sealing them. Retort packaging destroys microorganism by heating them and protects food from chemical or enzymatic reactions thus making the food good for consumption. Such factors are expected to increase demand for retort packaging. Rising government initiatives in various countries to improve hygiene in food processing units is expected to drive the retort packaging market growth. For instance, the government has launched various schemes to enhance food processing units. However, lack of technical expertise and requirement of high capital investment in the retort packaging may hamper industry growth. The retort packaging market is segmented on the basis of type into cartons, pouches, and tray. Pouches segment held a substantial revenue share in 2017, due to increasing demand from various food and beverage industries. Moreover, these pouches are filled with moist food and are able to maintain a viable shelf-life of the product. Tray segment is expected to grow with a significant growth rate over the forecast period. Based on material, retort packaging market has been segmented as aluminum foil, nylon, polyester, paperboard, food-grade cast polypropylene, polypropylene, and others. Food-grade cast polypropylene is anticipated to contribute for highest revenue share in 2017. The growth is attributed owing to its exceptional adhesion with aluminum and high moisture barrier properties. Polyester segment held significant growth over the forecast timeframe. The end-user segment includes beverage, healthcare, food, personal care, and others. The food segment is expected to grow with the highest growth rate over the forecast period. Growing consumption of baby food and sauces & curries across the world is anticipated to drive the segment growth. Furthermore, the lifestyle-related change would increase demand for ready to eat food. North America, Europe, Asia Pacific, Latin America, and the Middle East & Africa are regional segments of global retort packaging market. North America held a substantial revenue share in 2017. The growth is attributed due to the presence of major industry players in the region. The Asia Pacific is anticipated to exhibit promising market for retort packaging. Increasing disposable income of people coupled with growing demand for ready-to-eat meals are the major factors expected to drive industry growth in the Asia Pacific region. Some of the key players operating in retort packaging market include Sealed Air, Mondi Group, Bemis Company, Inc., Clondalkin Group, Coveris Holdings S.A, Amcor Limited, Sonoco Products Company, Ampac Holdings LLC., Berry Plastic Group, Inc., Winpak Limited Company, Flair Flexible Packaging Corporation, and others.